Sekvenskonst: Last of the Murry Mondays. Seems there isn't that much interest in seeing Paul Murrys cartoons so this is the last of the Murry Mondays. But to end it all I thought I sould bring you a grande finale. A halfpage from 1956 that never was finished. 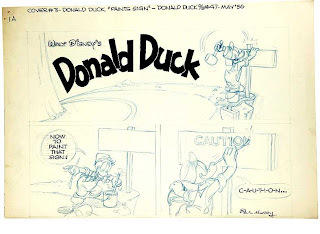 The original art belonged to Don Ault for many, many years but has now found its home in my collection. Just look at this piece. While there are plenty of 1970's pages available, there simply doesn't exist more pages like this. Intended as cover 3 in Donald Duck #47, May 1956, here it is. For those of you who want to see it in print: check out the next Hall of Fame volume devoted to Paul Murry.